Back in 1802, when I was married to my first husband, one of his sister's would host a Christmas Party each year and invite both her side of the family as well as her husbands. Between both of them, they must have had at least 50 people at their home. And so it was...a family tradition. Everyone would gather at Sandra and Moe's house for food, drinks and merriment. They were wonderful gatherings! So much love...so much warmth...so much fun! For me it was a true sense of belonging! However, there was one year that wasn't fun. It was the year, my daughter went with her father while I remained home with her brother. Yep. It was the Year Without Her Brother...you know kind of like "The Year without A Santa Claus" only worse for a little girl. You see, my son had been terribly sick and the doctor had told us to keep him away from large crowds just until he rebounded again. So, my husband and I decided that he would take our daughter, Jennifer, and that I would stay home with our son, Jason. Now if this picture just doesn't break your heart, I don't know what will. To this day, each time I look at it, tears well up in my eyes. It's a picture of my daughter at her Aunt's, holding one of her cousins. They were trying to cheer her up since her brother and I were not there. She was so sad that her brother and Mommy had to stay home. She even made her cousin, Jonas, sad too! But, the best part of this story is about another family tradition. The one and only Santa Claus used to stop by Sandra's and each child would have a chance to sit on his lap and get their gift. 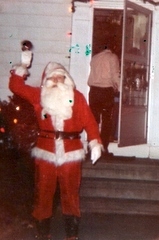 Well, because Jason was not there that year, they made arrangements to have Santa come to see Jason and I at our house! Now if that's not a "goosebumper", I don't know what is! So there's a lesson here: Just because you can't always be with the ones you love doesn't mean you love them any less! P.S. Please remember my motto: PAY IT FORWARD...make someone feel loved this Christmas! 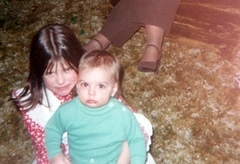 I've linked up with Lisa @ Two Bears Farm: Memory Lane Fridays . Go and see what other family traditions folks have! Very nice story JP. Merry Christmas!! What a great Christmas tradition. My DH's family used to do the same thing.....all the Aunts, Uncles, cousins, would all come to my FIL's house..but ours was only for the Smith side, FIL didn't like his wife's family so they weren't invited, but there were 9 brothers and sisters and time you added hubands wives and kids it was a house full. We all had so much fun. The second year DH and I were married, the tradition kinda started fading, the kids (cousins) started getting married and was busy with their new families and couldn't always find time to come, since the "head of the house" insisted it was to always be on Christmas Day, it dwindled down to just the immedate family and their spouses. I really enjoyed those first few years of all of the family together. A happy ending -- I love happy endings! Aww, glad Santa was able to stop at your house! I like that.....a good ending!